Glatt Safaris takes the frum traveler on the adventure of a lifetime, without compromise on kashrut, quality or price. 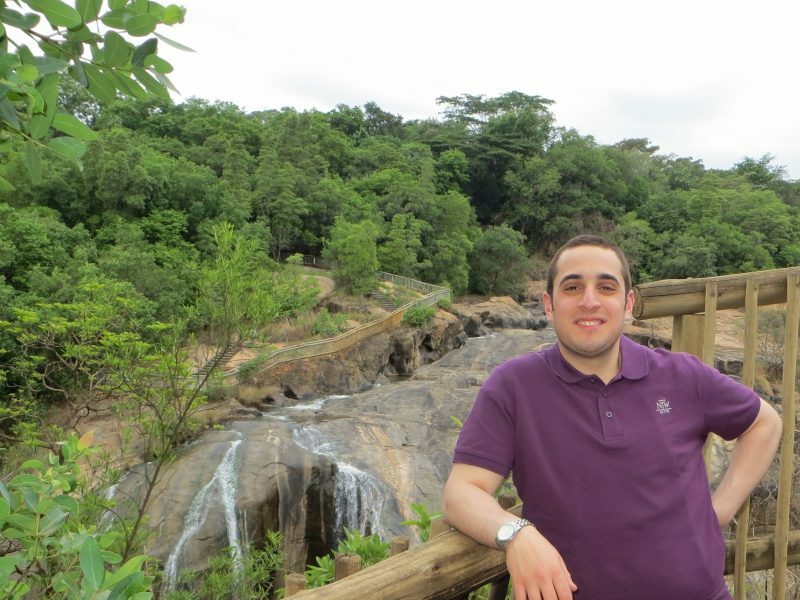 Glatt Safaris was founded in 2013 by Chananel Green, a frum Israeli-South African, after he organized a Safari trip for relatives from Israel and became aware of the challenges faced by the religious holidaymaker seeking glatt kosher travel solutions. 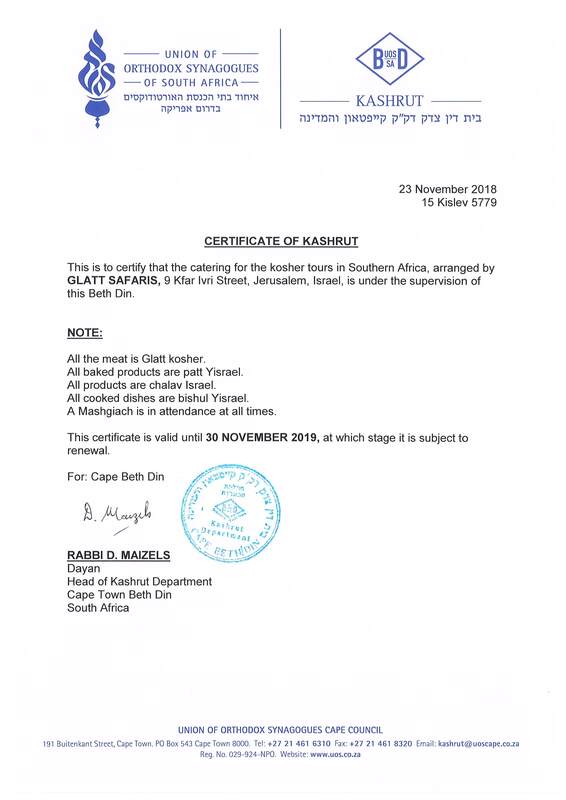 While generic tours don’t offer a kosher food option, the glatt kosher tours available in South Africa don’t necessarily specialize in gourmet food and can be very expensive. 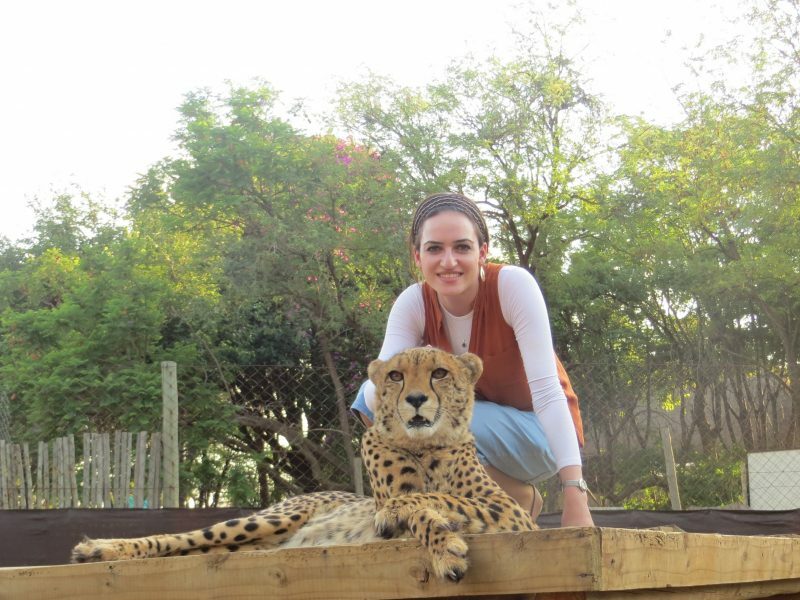 Chananel’s deep passion for tourism and torah has created an opportunity for religious Jews from around the world to experience South Africa on a glatt kosher holiday and in a way that suits their values, palate, and budget. Catering for the Torah-observant tourist with three gourmet kosher le’mehadrin meals a day, all supervised by the Cape Town Beth Din, plus minyanim, Sefer Torah, mikveh, places for netilat yadayim, even Kiddush wine and Shabbat candles – now you can be certain in the knowledge that we’re taking care of all your religious needs. While meals can be provided in Cape Town and Johannesburg by kosher restaurants as well, in more remote areas we always fly in our own food, chefs and mashgichim. We set up temporary kosher kitchens and provide imported kosher ingredients, which you can inspect for yourself. Want to learn more about how we ensure our meals meet the highest kashrut standards? While Kashrut often comes at the expense of taste and quality, we’ve made it our mission to change that, providing exquisite and exotic gourmet food at every three-course meal. Well known for their creativity in the kitchen, our handpicked chefs specialize in Mediterranean and South African style cuisine, from grilled lamb chops and roasted whole baby marrow to matbucha and Israeli salad. We cater to any specialized requests, including vegan and vegetarian. Glatt Safaris offers both public and private tours. Our public tours host between 20-30 people and offer two tracks, Silver and Gold. The Silver Track travels within South Africa, while the Gold track takes you throughout South Africa, Zambia, Zimbabwe and Botswana. Our private tours are completely customizable to your interests, desires and budget. Our professional tour guides, are locals with expert knowledge of every area we visit. They are well known for their fascinating stories about the spectacular scenery and incredible wildlife you will see. On every tour you will most likely see Africa’s Big Five – lions, leopards, rhinoceroses, elephant and buffalo – as well as whales and penguins. Our trips also include the chance to see Table Mountain and Victoria Falls, two of the Seven Wonders of the Natural World. Accommodations on Glatt Safaris range from three, four or five star hotels, to private reserves and VIP retreats. Get close up and personal with lions and elephants; discover our glatt kosher vacation packages now. At Glatt Safaris we believe that every frum family should have the opportunity to visit Africa on a glatt kosher Safari. That’s why we make it our mission to bring down the costs, so that your dream of visiting this incredible continent can become a reality. As a boutique lean company with strong supplier relationships, we are proud that we can offer the lowest prices in the business, without compromising on kashrut or quality. Start your Glatt Safaris gourmet adventure now. Founder of Glatt Safaris and a self-confessed perfectionist, Chananel is passionate about travel and determined that every member of the group should have an unforgettable experience. His mission is to plan ahead meticulously, and make sure everything runs like clockwork. While you’re enjoying the incredible wildlife and breath-taking views, he’s taking care of every last detail, from hotel check-ins to organizing minyanim and more. We call Mimi the Queen of the Safari, because she knows everything about how to book your dream trip. She’ll be able to deal with any queries before you set off, or anything that crops up while you’re with us. She loves the jungle, and joins us on safari from time to time, when she gets a break from bringing up two kids and a husband. A genius in the kitchen, Philemon will make sure you remember your trip not just for what you see, but for what you eat. 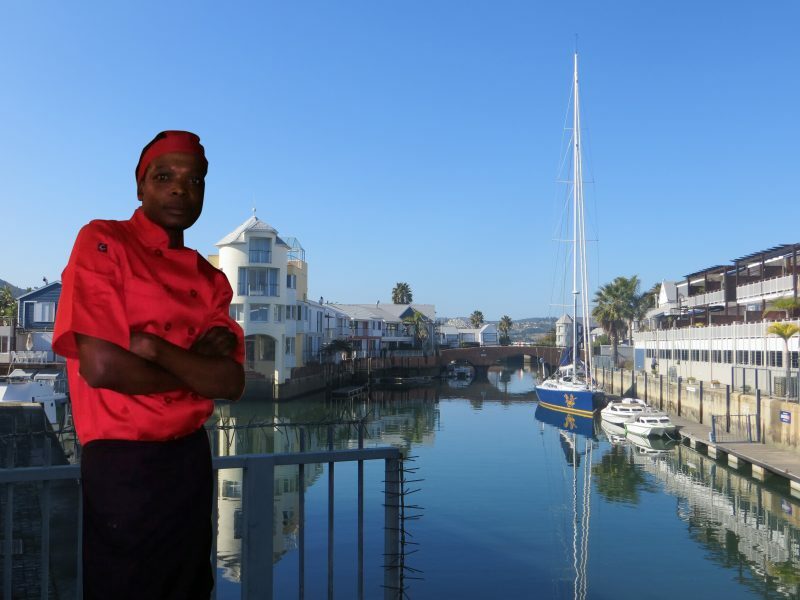 He’s a native South African with a huge repertoire of local dishes, and a particular taste for Mediterranean cuisine. 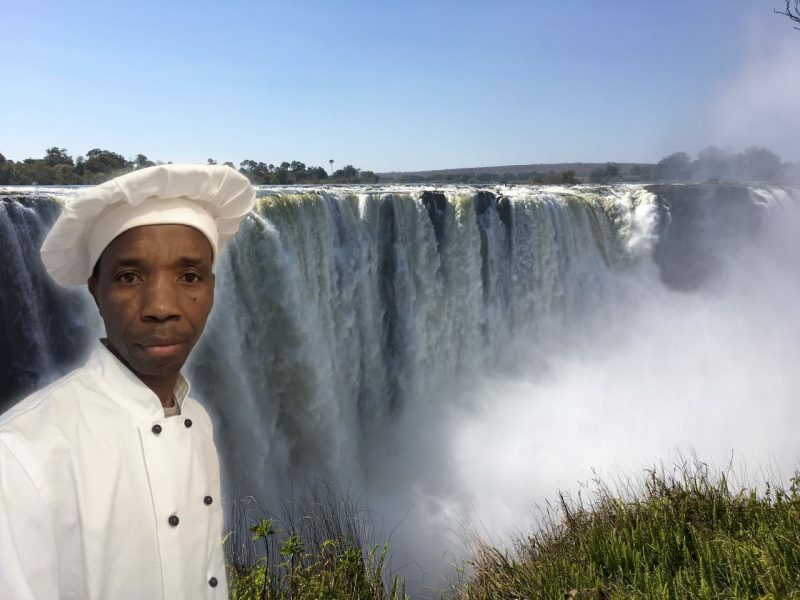 He has 25 years experience as head chef in kosher restaurants and kitchens in Johannesburg but loves nothing more than going native, cooking up a gourmet feast out in the wild. And he’s more than happy to cater for vegans, vegetarians or any other special diets. Samson is the singing sous-chef, who always has a tune as he cuts up mouth-watering mango, melon, cherries and papaya. Even peeling a mountain of carrots, potatoes and onions won’t wipe the smile off his face or stop him singing. Samson has worked in kitchens for 15 years. He says if you’ve had a great meal, he’s had a great day. Doctor’s delights are the perfect prescription to finish off any safari meal. So be prepared to put the diet on hold while you’re with us and tuck in to his irresistible desserts. Among his favourites treats from the oven are croissants, doughnuts and blueberry muffins. Doctor studied confectionery at college, and he’s been in the business for more than 10 years. We are Badatz Cape Town Kosher approved. The most formal kind of Kosher in Cape Town, you won’t find anything more reliable! The hotels are also Badatz Cape Town approved, as well as the pre-packaged meals we take on the trips. Feel free to contact us and speak with our Mashgiach, who also joins us on Safari.